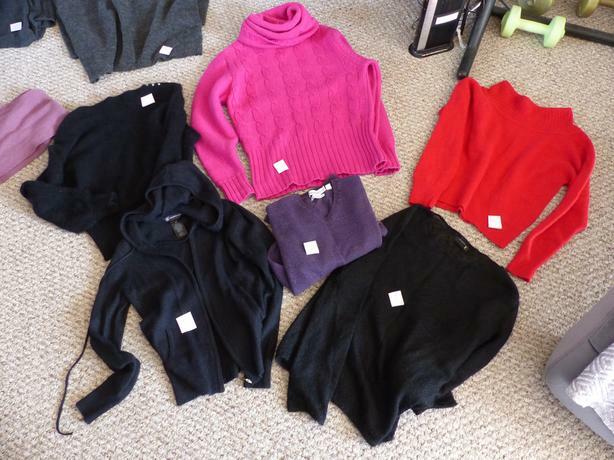 New Cashmere, Merino or regular wool sweaters ( I have a bad habit of buying quality sweaters for gifts and then giving something else) so I'm selling most of these for half price. Make great gifts to someone or yourself. #1 Dark Grey Melang Majka V-Neck Pullover Size Large Mohair Wool and more. Paid $139. Ask. $60 OBRO Never worn. #3 CASSIS Merino Wool sweater open front wrap around Size med. worn twice Paid $160. Light Cherry color wool scarf $15. and I have more scarves just no time to list them and other sweaters. Downsizing cleaning out closets.